Hello, Mr. Sundström and welcome to officialconcerts.com. What is Sabaton preparing for the fans in the following months? We are currently recording our next album and planning the biggest tour we ever done. In which stage are you with the new album and how will it be compared to your previous releases? We are about halfway through. It will be great. I think it will be a bit faster and heavier then for example Art of War. Sabaton has been confirmed again in 2010 for numerous festivals in Europe: Hammerfest, Metaltown, Graspop Metal Meeting, Hellfest, Metal Camp or Bang Your Head Festival just to name a few. How important are these festivals for a band? Do you prefer playing in big festival or in smaller concerts, just with your fans? Are these festivals a confirmation for Sabaton’s position in the metal scene? The festivals are the key to growing new fans and it’s of course amazing to see the big crowds. But it’s difficult to be personal with the fans on such big events. I prefer a venue with about 1000 ppl capacity. It’s perfect for atmosphere and also great for getting personal with the crowd. Name 3 Sabaton songs which you would recommend to someone that hasn’t listened your music so far. Ghost Division, Cliffs of Gallipoli and Primo Victoria. Looking back to your albums, from “Fist for fight” to “The art of war”, how would you describe your evolution as a band, as a team? In the beginning we did it without a purpose, without a clear goal. We had no plan for the songs. We just did them. On the later we have been listening more to the ideas of our fans. We have also tried to reach a sound that reminds more of a liveshow. 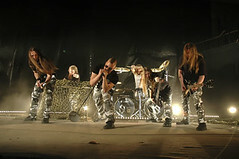 Since we believe that Sabaton is better live then on album. Your lyrics are often referring to modern warfare. Why did you choose this lyrical line? Are you guys passionate by this domain? We choosed it since it means more then the traditional metal lyrics. Also we find it much more interesting to write the lyrics if we can do some research on them at the same time. What’s your opinion regarding the European metal scene? Are there any young bands you would like to recommend? Sonic Syndicate. They are amazing live. I have rarely seen a band with more energy onstage. I love them. Thank you for time and if you want to add something for your fans that are reading these lines, please do. Check our website, on the 26th of February we announce the tour. Don’t miss us when we play live. It’s much more fun than on album.